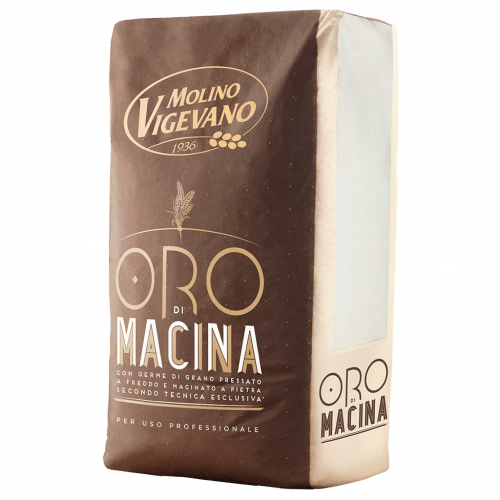 Oro di Macina flours born from a careful selection of precious gratings and are the only ones with vital wheat germ, cold pressed and ground to stone, according to an exclusive patent by Molino Vigevano 1936. With Molino Vigevano flour you can rediscover the true taste of wheat thanks to the presence of vital wheat germ, which will lend your products a unique aroma and flavour, together with the characteristic golden colour. 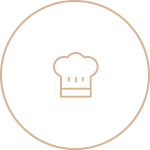 The wheat germ it is the heart of the grain, as well as being the most nutritious part: it represents a true source of well-being too, thanks to its high content of vitamins A, B, E and D, iron, magnesium and potassium. Thanks to the careful selection of raw materials, decades of milling experience and the use of cutting-edge technology, Molino Vigevano flours guarantee excellent dough stability; this is why they are easy to spread without fear of “tearing”. The dough produced using Molino Vigevano flour is particularly light and easily digestible. 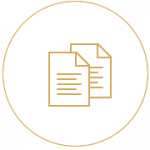 Furthermore, by carrying out laboratory analyses and thorough checks on each individual batch of products, Molino Vigevano guarantees that the quality and properties of its products remain constant, all year round. Costiera Oro flour is ideal for daytime leavening from 6 to 8 hours at room temperature. Available in 10kg and 25kg bags. Available in 10kg and 25kg bags. Costiera Oro flour is ideal for pizza, focaccias and bread.